August 2016 – Reform in 5 Minutes! The U.S. Healthcare system is one of the most advanced systems globally with respect to innovation. But some aspects of the industry are flawed. The tremendous waste in the system was reviewed in the last 2 blogs. Administrative burden is one area of waste that we all live with every day. With respect to facilities, administrative spending is around 25% of hospital expenditures, compared to half that in countries that have these costs under control. In the U.S., nearly 14% of a physician’s revenue is sucked up by administrative costs. And it’s rising! Administrative costs include just about any non-clinical activities, but include coding, billing, claims processing, privileging and credentialing of physicians and mid-levels, quality reporting, just to name a few. 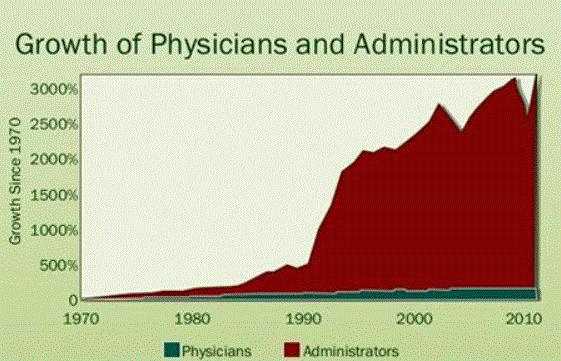 Look below at our industry growth of physicians and administrative personnel over the last 40 years – it tells the story of the change in level of support for each physician working. So how do we fix this problem? It’s not an easy answer. If you search for it in the literature, you will find the usual speak about “standardizing”, “centralizing”, rendering more efficient, “integrating”. How do we just go ahead and “do” those things? We can’t. But the solution is coming. It’s in small business healthcare IT. The U.S. has seen an explosion in healthcare IT start-ups that are solving the inefficiencies in the system. These small companies are addressing one or more problematic processes and leveraging software to solve it. For example, take Modio Health. This small company is rendering the credentialing process more efficient for physicians by storing a physician’s information put in once, to be used for all privileging and credentialing processes. There are a thousand of these start-ups in healthcare. This has become a movement where small business America will help flush out inefficiencies and waste in our healthcare system, including the administrative burden. Although these cloud based solutions tend to be affordable monthly fee applications, it will still benefit us to leverage the clinically integrated network model to benefit from economies of scale administratively.